My friend Dave Griessmann and I traveled up I-71 last night to visit the Columbus, OH. stop of The Woodworking Show. Actually, we went to meet with Chuck Bender who was presenting seminars during the show. As Dave and I walked around the show, I got a look at a table saw sled shown at the left. The sled at the show reminded me of the ones prevalent at Marc Adams School of Woodworking. Adams has taken his sleds the extra step by adding on a thick block on the front side of the jig in which the blade is buried as your cut is completed. This, I’m confident, is to lessen exposure to students unfamiliar with everyday woodworking. Adams also nails a stop to the benches that surround his table saws to keep the jig from sliding any farther forward, also keeping the blade buried in the attached block. I’ve always been partial to a sled design made popular by Mr. New Yankee Workshop. In fact, I have built and used a sled similar to the one shown at the right for many years. It’s easy to build, simple to use and the only downside I see is that there is no support for the cutoff piece – it falls to the tabletop. That’s not a big deal because I use this jig to square panels or cut at 90 degrees, so I’m mostly trimming the ends and the cutoff is waste. 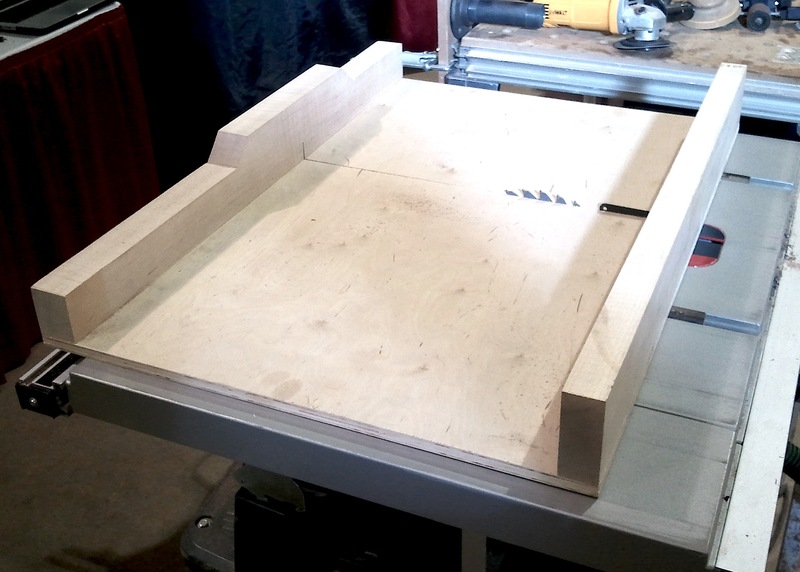 Another reason I chose this jig design is because you can cut over-sized panels; those larger than the jig base. The jig shown at the top cuts panels only as wide as what fits between the rails or inside the jig. I like this jig so much I built a smaller version for use on my Bosch Job-site saw that I use when traveling. If you’re interested in building this jig for your shop, Popular Woodworking Magazine has posted the article I wrote for a Jig Journal column online. Click here.